The schedule below provides further description of our small group travel itinerary. 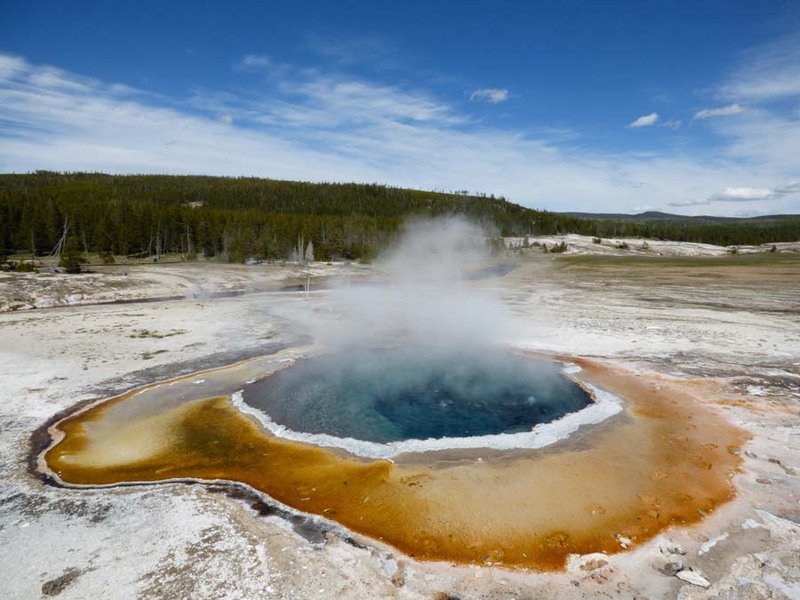 Plunge into the mysterious, boiling and hissing world of Yellowstone National Park. Stand beside the rumbling power of a waterfall, hike along deep gorges on natural trails, snap photographs of wildlife from our comfortable, air-conditioned van, and stroll the streets of towns in the Wild West. End a day of once-in-a-lifetime experiences in Yellowstone with a comfortable stay at a locally owned lodge with views of a wild river and an occasional deer or moose. Experience the outback of Utah and Wyoming. Enhance your understanding of the history and culture of the area in the company of our experienced guide and driver and on the ground during our frequent stops and walks. With our flexible, yet well-planned, outdoor adventure tours, we immerse you in the unique, natural beauty of these world famous landmarks. For more details and information please contact us! Depending on your arrival time (airport transfer included) stroll around the impressive Mormon Temple Square, headquarters of the Mormon Church, then visit Utah’s capitol building – all in walking distance to our base hotel. We meet at 5:30PM at the hotel lobby. Your tour guide will inform about the tour and hand out a tour documentation. At a nearby restaurant the tour participants will get to know each other. You will be invited to an antipasti and drink. Click on a photo to get further information about the highlights of the day! Leaving Salt Lake City, we stop at the 2002 Winter Olympics Park, featuring the Alf Engen Ski Museum. Enjoy superb outlet mall shopping nearby, then proceed to Fossil Butte National Monument and explore the unique landscape and fossil displays. Night in Jackson, Wyoming a unique and Western town with attractive galleries and shops. Explore at your own pace the wild west town of Jackson with its many galleries and cowboy stores. Optional activities include a scenic float trip lead by a naturalist on the beautiful Snake River. In the afternoon, we walk along Jackson Lake with views of the Grand Tetons. Drive to Yellowstone National Park. West Yellowstone, 2 nights. This day’s highlights include views of the park’s own chasm, the Grand Canyon of Yellowstone. Hike along the canyon rim with views of nearby Upper and Lower Falls and a backdrop of colorful, sulfur-stained cliffs. Drive through Hayden Valley, famous for its wildlife. Next, experience for yourself Old Faithful geyser and the historic Old Faithful Lodge. Walk along thermal pools, boiling streams, roaring gas vents, and brightly colored algal mats, then explore the west thumb of Yellowstone Lake, the caldera within a caldera. Today we explore active geothermal mineral pools at Norris Geyser Basin. We stop to picnic at fascinating basalt cliffs , then move on to Mammoth Hot Springs with their unique travertine terrace formations. Expect to spot wild buffalo, elk, prairie dogs, and sometimes bears, moose, and porcupines as we drive over Dunraven pass through scenic wildlife areas. Night in Gardiner. Drive through Yellowstone’s animal rich Lamar Valley over Beartooth Pass, an all American highway with beautiful scenic views and waterfalls. On to Cody, where we visit Buffalo Bill Historical Center, with a unique display of Native American artifacts and art of the Wild West. Revisit the settlement of western America, and the depiction of surrounding natural wonders. Good-bye dinner at a historic restaurant. Night in Cody. Continue travel on your own, or journey home. We will gladly assist you in booking further travel! If you have any questions about our North to Yellowstone travel tour, please feel free to contact us at info@traveldreamwest.com. Our North to Yellowstone tours leave three times a year and can also be reserved for a group as a custom adventure travel tour.